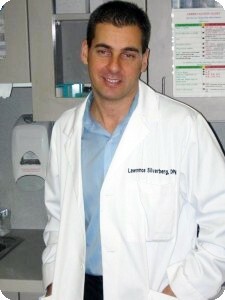 Best Bunion Surgeon NYC - Dr. Silverberg has been called the best foot surgeon in NYC. I started this website to educate patients and doctors on bunion surgery. Bunion surgery is the most common surgery I perform. I have been called the best bunion surgeon in NYC which I am very proud of. I started my private podiatry practice in 2000. I quickly grew to own and operate my large group practice. In January 2013 I changed my practice focus to concentrate only on foot surgery and all other podiatric problems are treated by my partner doctors. I perform many different types of bunion surgeries ranging from small bunions to some of the worst bunions you can imagine. I perform bunion surgery on young people who experience painful bunions only on occasion, to more advance bunions that hurt every day. I operate on bunions that only hurt where they rub on shoes, to bunions that are severely arthritic and hurt constantly, even out of shoes, and everything in between. Similar to bunion surgery, I operate on hallux limitus (limited range of motion of the big toe) every week. I pride myself on using the newest and most advanced procedures to correct bunions. Having trained under plastic surgeons in my surgical residency and also used advanced plastic surgery techniques to remove excess skin after bunion surgery for the most cosmetic results. Today I’d like to discuss recovery after bunion surgery. Not everyone will have the exact same experience but I’ll generalize what to expect in your recovery after bunion surgery starting with day one, and going to one year after bunion surgery. Recovery will depend on a few things. First and most important, is what type of bunion procedure you have done. I’ll try to generalize for both large bunion procedures and small to moderate bunion surgeries. I do most of my bunion surgery on Friday’s. That way my patients have the weekend to stay off their foot as much as possible. Friday when you leave the surgery center, you must take a car home. No buses or trains. Most people have a friend or relative ride with them in a taxi or black car. To those of you reading this not in New York City, that probably sounds foreign, but us NY’ers don’t drive much. For most of my bunion surgeries, you walk out of the surgery center on Friday with a Cam Walker (boot) with a cane. This applies to my distal metatarsal osteotomies, Keller procedures and scarf procedures. For my Lapidus bunion surgery as well as closing base wedge osteotomies, opening base wedge osteotomies and first metatarsal joint fusions I have patients non-weight bearing with crutches. Note: I’ve written about the above named surgical procedures in other blogs so I will not explain each here. Click here for bunion surgery procedure descriptions. I do not do both left and right (bilateral) bunion surgery at the same time 99.9% of the time. It is very rare to never that I recommend doing both bunion surgeries at once. I will space them out 2-4 weeks to overlap recovery but I strongly feel you need one good foot to walk on right after surgery. For the procedures that I allow patients to weight bear in a cam walker, I recommend walking on the heel of the boot for the first week to few weeks. The cane is for balance so that you don’t fall over and land on the surgical foot and move the bones. I have never had anyone move the bones that listened to what I instructed. The two circumstances where I had to bring the patient back to the OR in the recovery period for moving the bones, both did not listen and were way too active after surgery. They both told me that it did not have postoperative pain so they figured they could be more active. One ran around her yard with her dog less than one week after surgery. Don’t do that! When you get home Friday, I recommend staying home for Friday, Saturday and Sunday. I like to call it, “bathroom and kitchen only”. Keep your foot elevated above your hip. Keeping it above the heart is something I hear all the time, but that’s a fallacy. As long as gravity goes down from foot to thigh, the fluid and blood will drain into the larger vessels of the lymphatics and veins. I guess above the heart would work too, but it’s much more difficult and unnecessary. I set up my patients with a cold compression therapy for postoperative use. This boot gets cold and then inflates and deflates every thirty seconds. This really helps with pain and swelling. While we’re talking about pain, about 80% of my patients tell me that they have little to no pain after bunion surgery. There are things I do to minimize pain, but of course I offer no guarantees, and alert my patients that they may have pain after surgery. In addition to the cold compression, I utilize surgical techniques that reduce pain. This starts from the beginning of surgery, not after surgery. I prescribe Vicodin or Percocet for postoperative bunion surgery pain but many patients tell me that take only one or two the entire time, and some none at all. I recommend taking one when you get home from surgery, and then seeing if you need more after that. In addition, I use a long acting anesthetic and infiltrate the surgical site in order to allow it to be absorbed very slowly and keep it numb for a long time. Some people report being numb, and thus pain free, for 24 to 48 hours after surgery. This is very desirable effect because if you are going to have pain, this is the worst time for it. There are also some other small things I do during the surgery to minimize pain. Wow, this blog is getting long and I’m still on the night of surgery. Day two and three after bunion surgery are pretty uneventful. Just continue “bathroom and kitchen only” and elevation. I prescribe 5 days of antibiotics to prevent infection so don’t forget to take them. You will have a bandage on your foot which you need to keep dry. You do not remove this bandage. I will do that at your postoperative visit. I dispense a shower bag which works amazing to keep your bandage dry. It is reusable and makes life much easier after surgery. I buy these in bulk and give them to you for free. You keep your foot and bandage dry for 12 days usually, assuming the skin is healing normal when you come see me for your second postop visit. By Monday, you can start walking a bit. I tell my patients they can walk about 5 city blocks to go to the store or other things. For those not in Manhattan, 20 blocks uptown / downtown is a mile, so that’s about ¼ mile of walking. If I do the right foot you cannot drive for four weeks. This also applies to left foot with a manual transmission. On Wednesday, 5 days after Friday surgery, you must come to my office for a follow-up visit. Take the subway, bus or a taxi (or get a ride by car) and try to keep the walking down to 5 blocks maximum. On the first postoperative visit on day 5, I will change your bandage. I inspect the foot to make sure there are no infections or other complications and I will re-wrap your foot with a soft cast. This is just a pasty bandage that does not harden and is not bulky. I will perform postoperative x-rays and show them to you. This is were people first get to see the results of their surgery both clinically and on x-ray. Most are pretty amazed! At this time, expect your foot to be swollen and bruised. This is all normal. If you listen and stay off of it, the swelling and bruise will be minor to moderate. If you abuse it, it will be more swollen and bruised. Most people take one week off from work for a desk job. People that are on their feet at work all day, such as nurses, retail, construction, police, etc., take 4 weeks off. I have had police officers take 4 weeks off then go back to desk work for an additional 2-4 weeks before returning to active duty ‘chasing perps’. I’ve learned that police officers hate desk work! You continue to wear the cam boot for 4 weeks. If I do one of the larger procedures, Lapidus, base wedge or fusion, you will be in the cam walker for longer. Depending on the procedure you will be on crutches for 6-12 weeks and in the boot for this period. When I see you preoperative I’ll have a better estimate of that 6-12 period depending on your x-rays and exam. On your second postoperative visit at 12 days, I will again inspect your foot. As long as the skin is healing normally, I will now allow you to get your surgery site wet. By wet, I mean shower but do not soak. You should not keep your foot submerged for any extended time. Some people choose to continue the shower bag and use a washcloth with soap and water after their shower. I don’t have a preference, quick, non-soaking shower or that method. I will dispense a special wrap that you will use after each shower to wrap your foot. The next two weeks you will continue to limit weight bearing to under 10 blocks or so at a time. The next visit is at the 4 week mark. This is a graduation day, out of the cam walker. Well, almost. I usually see postops on Wednesday and your 4 week anniversary is on Friday. Assuming the bones look good on x-ray, on Friday you can remove the cam walker and get into a shoe. The best are sneakers, but you may also use loose fitting casual shoes, boots or other footwear that fits. Many people buy a temporary shoe that is 1-2 sizes larger so it feels better. At the four week mark most people are able to start exercising a little. I allow walking up to 20 blocks or one mile. I allow stationary bike (not spinning class). I tell patients if its swelling more or is painful, you’re probably doing too much. At the 4 week mark I often instruct home exercises to do to get the big toe moving more. You do these exercises 1-2 times per day, 10 repetitions up and 10 down. I then have you come back 4 weeks later at the 2 month mark. At this visit I determine if you need physical therapy or not. About 50% of people do PT after bunion surgery to get the range of motion to return faster. PT after bunion surgery usually consists of going twice a week for 4-6 weeks, or 8-12 sessions. They also will teach you more home exercises. Therapy also reduces swelling, stiffness, and scar tissue. Which brings me to ‘scar tissue’. The medical term for scar tissue is induration. Induration is the thick scar tissue that builds up after any surgery or injury. The body’s natural healing process involves scar tissue forming in order to immobilize the area so it can form new tissue to heal and not tear the new tissue that forms. This scar tissue takes a long time to go away. I tell my patients it will take 6-12 months to go away completely. This doesn’t mean you can’t fit shoes, exercise or wear high heels after bunion surgery for the ladies. It just takes a while for the size to return to normal, the toe to move normal and to do things that require lots of motion. Another advantage of PT is that they teach you how to use your foot again. After two months of not using it normally, some people really like the ‘gait training’ aspect of PT. Sometimes I prescribe PT much later than 2 months for this purpose too. Going back to your 2 month postop visit, at this time I instruct patients that they can increase their activity a bit more. Most are back to elliptical machine, yoga, Pilates, spin class, low impact aerobics and walking long distances. I will not see patients for another month at this point so I instruct them that they can start increasing activity to tolerance over the next 1-2 months. They can start wearing feminine or high heeled shoes. They can start jogging 1-4 miles after 3 months postop. For running after bunion surgery, my recommendation is to wait 3 months. At 3 months I tell them to start slow and slowly increase speed and distance to tolerance. This means if it swells or hurts they’re doing too much. I remind them that it may swell or hurt the next day after activities. The next follow-up appointment after bunion surgery is at 4 months. By this time the joint is moving more, but still stiff in most cases. I encourage using the foot more normally which helps increase range of motion and reduce stiffness. If they have not done PT yet and are still stiff I will often recommend they start PT. At this visit I’ll take an x-ray to make sure it all looks good and the screws have not moved or anything else doesn’t look right. By 4 weeks after surgery the bones are usually very solid and by 4 months they are almost completely healed. It takes about 18 months for the bones to ‘remodel’, which means they are pretty normal at a cellular level. The next post op visit is at 8 months after surgery. At this visit I’ll x-ray and examine the surgery site. If the patient is still complaining of scar tissue I discuss possible steroid treatment. This involves a lidocaine nerve block to the area. Once it’s numb, I then perform multiple small steroid injections into the area of scar tissue. These injections work really fast and really well to bring down the scar tissue. I only recommend this if the patient is complaining of not fitting into ‘cute shoes’ or having discomfort that limits their ability to do their desired activities. Most of the time people do not need these injections and the scar tissue will go down over the next 4 months. Again, physical therapy may help reduce scar tissue further. This brings us to your last visit, 12 months after bunion surgery. Again I’ll x-ray and examine you. At this time the scar tissue should be gone or mostly gone. If it is a complaint, I will again recommend steroid injection if necessary. We then hug and part ways unless you come back for your other foot. My staff announces your graduation and that you do not need to make additional appointments and we all say good bye for now….